(1) Search engine optimization (SEO) – what use is your website or app if people cannot find it? Most websites or apps look extremely nice but do not rank well on search engines, therefore, are hard to find by your customers who are actively searching for them. (2) Mobile browser optimization (MBO) – we make sure your website or app is optimized for mobile smart phones. Why do most web designers miss the above two points? Because as a business owner, you are busy enough without paying attention to these things and most web designers do not want you to know about them. Or they want you to know about them but they charge a lot for you to have them. Doing any of the above and doing it right takes effort, skills and time. Charging a high price for these services is understandable. But the thing is, you already got charged a lot of money for a website or app WITHOUT getting any of the services we list above – we do not want that to happen to you. 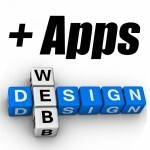 Our motto is this: If you ask us to design a website or app, we will do it right. Period.